Mobile users love to connect to the Internet, and they want to be able to get online from anywhere. In response, Wi-Fi hotspots are popping up all over the world, offering Internet connectivity in diverse environments. But despite the enormous increase in wireless hotspot numbers, many areas still lack coverage, leaving you and your devices stranded. 1. 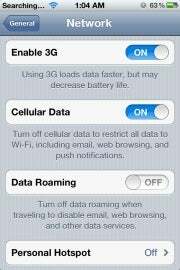 Enable the tethering option on your carrier's data plan. Many carriers charge extra for this service, and prices vary, so contact your carrier for specific details. 2. Make sure that you have an iPhone 3G or later. Only these generations of iPhones support tethering. 3. On your iPhone, tap Settings, General, Network. 4. Tap the Personal Hotspot option. 5. Tap the Wi-Fi Password option. This will enable you to prevent unauthorized devices from connecting. 6. Type your desired password and tap Done. 7. Slide the Personal Hotspot option from OFF to ON to enable Internet sharing. The phone will create a Wi-Fi network with the same name as your iPhone device name (John's iPhone, for example). To connect your other devices to the phone's Internet connection, add them to the Wi-Fi network that the phone created, using the same process you would for any other Wi-Fi network. You'll have to follow different steps for Windows 7 devices and for Mac OS X, as follows. 1. Click the wireless network icon in the system tray to bring up the list of nearby wireless networks. 2. A network with the same name as your iPhone will appear. Select this network, and click Connect. 3. Type the password you chose for the network, and press Return. 1. Click the wireless network icon in the menu bar at the top of the screen to bring up the list of nearby wireless networks. 2. A network with the same name as your iPhone will appear. Select this network. Once devices are connected to your iPhone, a blue bar will appear, indicating how many devices are connected to it. 1. On your iPhone, tap Settings, General, Network. 2. Tap the Personal Hotspot option. 3. Slide the Personal Hotspot option from ON to OFF to disable Internet sharing.